The Syringa flower was designated in 1931 as Idaho’s state flower. 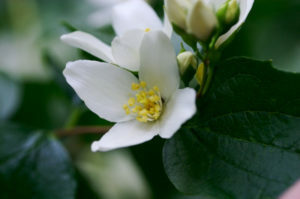 Its scientific name is Philadelphus Lewisii and is named after Meriwether Lewis of the Lewis and Clark Expedition. The Idaho Federation of Republican Women (IFRW) proudly uses the Syringa flower to designate its Syringa Regent Sponsor. 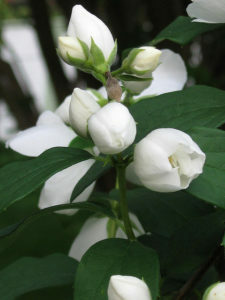 A Syringa Regent Sponsor is magnificent like the state flower. We would like to ask you to join us in our annual Syringa Regent sponsorship by contributing $100.00 to the IFRW. This premier donor contribution is exceptionally valuable because it assists in continuing education and professional development of current and future Republican Women leaders and Republican Women in leadership roles throughout the state of Idaho. We invite you to become a Syringa Regent Sponsor so that the IFRW can continue to champion Republican Excellence through its educational programs and campaign efforts in electing quality Republicans in the Great Gem state of Idaho. As a thank you for your generosity in becoming a Syringa Regent Sponsor, you will receive a "Syringa Flower" pin to proudly wear and show your support for the IFRWS. In addition, you will be specially recognized as a generous supporter of the IFRW on the IFRW website and your name will be announced at the IFRW state conventions & meetings. You will receive a Certificate of Appreciation at the following Spring or Fall Board meeting upon the receipt of your contribution. A Syringa Regent Sponsor will be invited to be seated with Guest Speakers when possible and are eligible for a group photo with all the Syringa Regent Sponsors statewide with the Governor during the IFRW Spring Board meeting at the Capitol in Boise. Your annual contribution of $100 per year will ensure the success and future of the Idaho Federation of Republican Women. As always, we are grateful for your kind consideration and we look forward to your participation. Look for your name on the IFRW's website's Syringa Regents Sponsor list by donating on-line TODAY! Click below to purchase your annual Syringa Regent membership!